Newark, NJ (February 5, 2018) –. U.S. 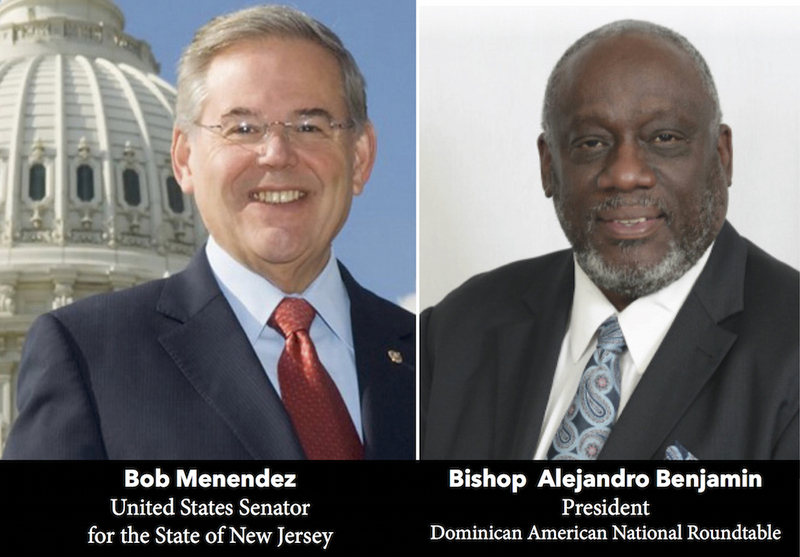 Senator Bob Menendez of New Jersey will administer the oath of office to Bishop Alejandro Benjamín as the 10th President of the Dominican American National Roundtable (DANR), the only Washington DC-based nonpartisan organization advocating for the socio-economic and civic empowerment of Dominicans in the United States and its territories, including Puerto Rico and the U.S. Virgin Islands. “I commit to giving the best of me. Me comprometo a dar lo mejor de mí”, said President Alejandro Benjamin. 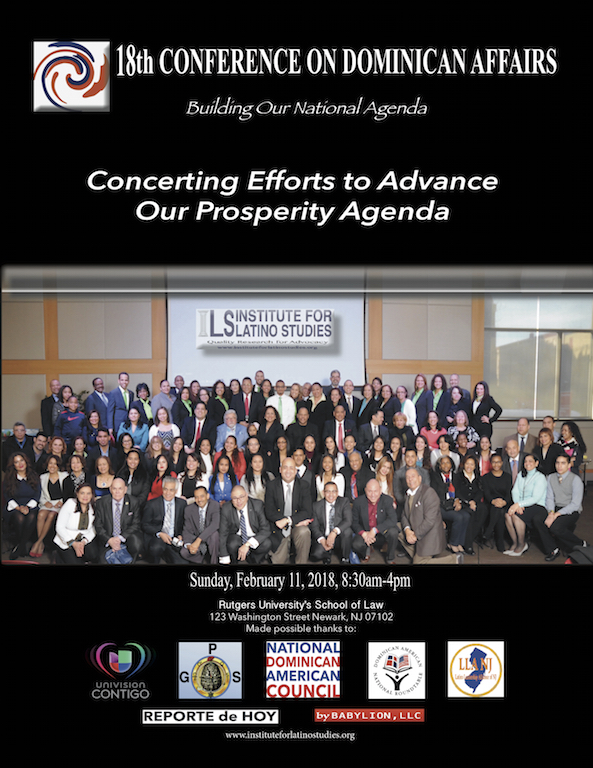 The highly anticipated Swearing-in Ceremony will take place at Rutgers School of Law at noon on Sunday, February 11, 2018 during the Luncheon Reception of the 18th Annual Conference on Dominican Affairs (CODA) coordinated by the Institute for Latino Studies (ILS). The conference will take place from 8:30am to 4pm at Rutgers School of Law located at 123 Washington Street Newark, NJ 07201. Bishop Alejandro Benjamín is a tenured professor of Sociology at Bergen County Community College where he has served for more than 25 years. He is an Evangelical Bishop and Senior Pastor of Rock of Salvation Church as well as a consummate highly respected and well-known community leader and prolific author with expertise in graduate level social work education, research, community-university capacity building partnerships, political advocacy, organizing and faith-based institutions. Bishop Benjamín is originally from Barahona, an old poverty-stricken town in the southwestern of the Dominican Republic. He came to the United States via Paterson, NJ in the 1970s. Since then he has resided in the great State of New Jersey, where he settled with his family. He is married to Yolanda, with whom he has three children: Jessica, Raquel and Alejandro III, and four grandchildren. With his election, Benjamín becomes the 10th president of the DANR. He will serve a two-year term from 2018-20, with the option to be reelected. The list of previous DANR presidents includes Víctor Capellán, Adriano Espaillat, Margarita Cepeda, Ana García Reyes, Cid Wilson, Néstor Montilla, Sr., Dr. María Teresa Montilla, Francesca Pena and Claribel Martínez Marmolejos. At the Swearing-in Ceremony, President Benjamin will be accompanied by his presidential cabinet composed of Vice President Dr. Miguel Hernandez, Chairwoman Dr. María Teresa Montilla, Treasurer María Trusa and Secretary Dan-el Padilla, Ph.D. In addition, DANR board members from across the United States who will be present, include Patricia Vazquez from Pennsylvania, Ana Medina from Massachusetts, Joseline Pena-Melnyk from Maryland, outgoing DANR president Claribel Martínez-Marmolejos from Puerto Rico and the US Virgin Islands, DANR National Youth President Janna Rodriguez from Long Island in New York, National Youth Vice Presidents Franklin Ventura and Augusto Suarez from New Jersey, Nestor Guarien Taveras from Puerto Rico, Ernie Dominguez, Esq. from Washington, DC, Rev. Alvin Bridgewater and Jose Cruz from Upstate NY, Heidy Hernandez, Jose Colon, Nestor Montilla, and Dulce Ramos from NJ, Raul Acosta from Connecticut, Yudelka Tapia from the Bronx, Francesca Peña from the Dominican Republic, and newly appointed board members Debralee Santos, Valentin Silverio, Hector Nunez, Yini Rodríguez, and Rosa Ayala from New York, and Dr. Carlos Lugo, Fernando Aguasvivas and Ezequiel Jimenez from New Jersey. In addition, a select group of members and leaders of the National Dominican American Council (NDAC) from around the United States will join NDAC Chairman Nestor Montilla, Sr., in support of DANR President Alejandro Benjamin and his board of directors. Some include Delfin Vasquez and Councilman Julio Guridy from Reading and Allentown Pennsylvania, Dr. Ana Marchena, Leodany Inojosa, Alexander Bejaran and Alberto Correa, Ph.D. from Puerto Rico, Gino Hernandez from Trenton, NJ, Juan Kivelier and Yohanny Mendez from Paterson, NJ, Belkys Pena from Rhode Island, Victor Coronado from Perth Amboy, Hector Ramirez from the Bronx, Claritza Abreu from Massachusetts, Juana Edmond from Newark, NJ, and among others Mildred Rojas from Camden, NJ., and Eduardo Christopher from Boston, MA. The list of elected officials expected to attend includes NYS Assemblywoman Carmen de La Rosa, PA Councilman Julio Guridy, Camden Councilman Angel Fuentes, Newark Mayor Ras Baraka, Paterson Councilman Alex Mendez, NJ Education Commissioner Joel Ramirez, Puerto Rico Legislator Claribel Martinez-Marmolejos, Newark Councilmenbers Anibal Ramos and Luis Quintana, NYC Councilman Ydanis Rodriguez, Passaic NJ Mayor Hector Lora and among others, US Senator Robert Menendez of New Jersey. 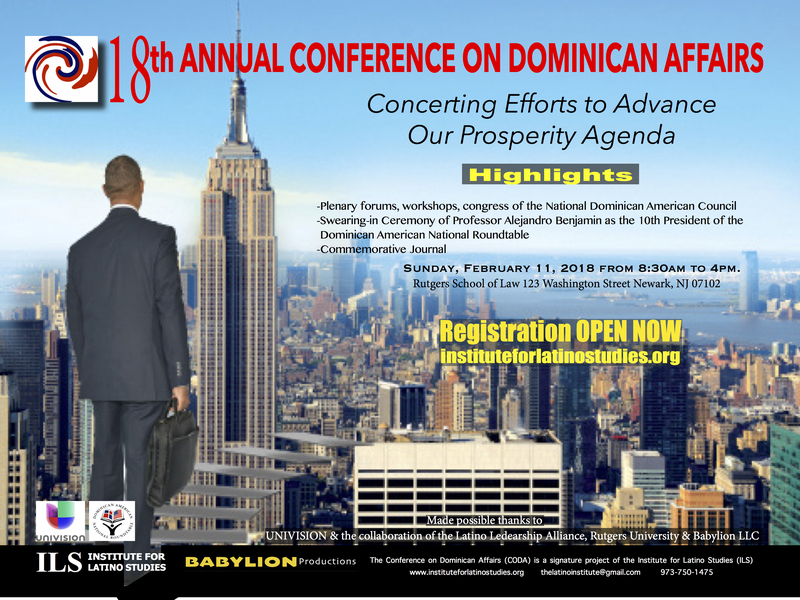 The 18th Annual Conference on Dominican Affairs is made possible thanks to UNIVISION and the collaboration of a select group of organizations including the Dominican American National Roundtable, the National Dominican American Council, the Latino Leadership Alliance of New Jersey, Babylion Productions, Reporte de Hoy, Nunez Tax Service and Global Psychiatry Services, PC. The Conference on Dominican Affairs is a signature initiative of the Institute for Latino Studies, which is presided over by a board of directors composed of distinguished leaders including Antonio Ibarria, publisher of El Especial, Tony Perez, Executive Director of the Paterson Parking Authority, Branhder Espinal, President and CEO of Espinal Business Services, Fernando Alonso, Esq., Director of Puertas Al Futuro at Fairleigh Dickinson University, Ingrid Betancourt, Director of the Newark Library’s Sala Hispanoamericana, Merijoel Duran from UNIVISION Channel 41, Nestor Montilla, Sr., Chairman of the National Dominican American Council and Sonia Rosado former Freeholder of Passaic County.